Embers at Galdrilene reaches out and grabs you from the very beginning. Set in a world where dragons and magic are real, A.D. Trosper gives us a post apocalyptic tale of a very different kind. Weaving together the lives of eight very different individuals, she immerses us in a world on the cusp of change. Hundreds of years earlier the Dragon Riders were all but wiped out. Now they have returned and they have a very difficult task before them. (One which is not completed within the scope of this book but books 2 and 3 are already out for those who are impatient about sequels). The best part for me was the characters and their relationships with their dragons. Trosper manages to give each one their own personality and voice, and you feel as though you know them by the end. You root for them. For those who enjoy a good sword fight, Embers at Galdrilene has plenty of that too, as well as friendship, loyalty and love. Her descriptions of the magical effects were vivid and I especially liked the air magic. If you love fantasy or love dragons, this book is a must read. For myself, I'm excited to read the sequels. 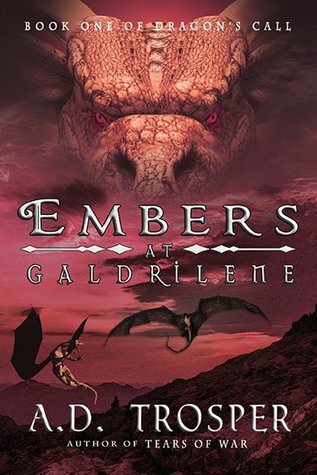 Sign into Goodreads to see if any of your friends have read Embers at Galdrilene.